In October 2010 my article on the NightSeeing™ program appeared in the Architect’s Newspaper. It was a welcome opportunity to describe the development of the program, current events and future aspirations. Savor the word “light” and the interior landscape of language evokes images of atmospheric effects—mysterious, picturesque, sublime. What is the NightSeeing™ program? Conceptually, NightSeeing is an itinerary of group exploration and discovery, a curriculum designed for the general public and those in the architectural and planning professions. Presenting the nocturnal city of light, NightSeeing is a real-time travelogue through the culture of urban lighting in public spaces to convey recognition of one’s own environment of the shadowed vistas that define our surroundings literally half the time, and yet are so familiar they are almost unseen. The program can stand alone, or be presented by a conference, festival, or as an event for urban planners to enhance their public outreach efforts. It provides a context to examine and decode the shadows, emanations, and reflections that define our cities’ darkened hours. NightSeeing consists of several events: the LightTalk, a LightWalk, and a Light Planning Workshop. The issues and substance of public illumination increasingly influence the global language of urban design and urban experience. Through initiatives like NightSeeing, we can learn to see shadows in a whole different light. 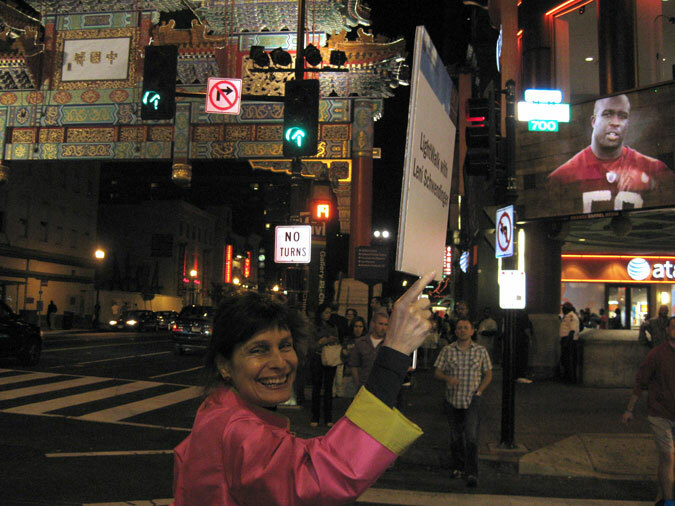 In the article I cover the NightSeeing™ LightWalks in Manhattan’s Little Italy/Chinatown, Bryant Park and in Washington D.C. The shifting interplay of nighttime dark and light makes every city a unique destination. For London’s Architecture Retail and Commercial Lighting Show on January 12, 2012, I look forward to mapping the Angel Islington district with the International Association of Lighting Designers to find the perfect route through preserved and chic-modern alleyways and unusual paved topographies. I spent time here in the 1970s frequenting Sadler Wells Theatre, the Angel’s Chapel Road second-hand market, and a particular pub with my crowd from the East End. For me, the LightWalk will be eye-opening to the pleasures of the crowds dining, walking from bus to subway to home, window shopping the antique shops, and experiencing evocations of Dickens’ darkened muddy passageways which have existed since the dawn of public lighting. Experience the urban light… contact Leni (leni@lightprojectsltd.com) to book NightSeeing™ in your town or city with your organization, company, friends and neighbors.